When a loan is amortizing, each payment goes to both paying the loan's interest and paying off the principal. When a loan is fully amortizing, it means that the entire principal will be paid off by the end of the loan's term. In contrast, if a loan is partially amortizing, only a part of the principal will be paid off, leaving what's commonly known as a balloon payment. In order to pay it off, the borrower will likely either have to pay in full, refinance the loan, or get a new loan. Fortunately for borrowers, HUD 223(f) loans are fully amortizing, which means that when the loan term is over (assuming the borrower does not default or refinance the loan), the entire principal will be paid off. 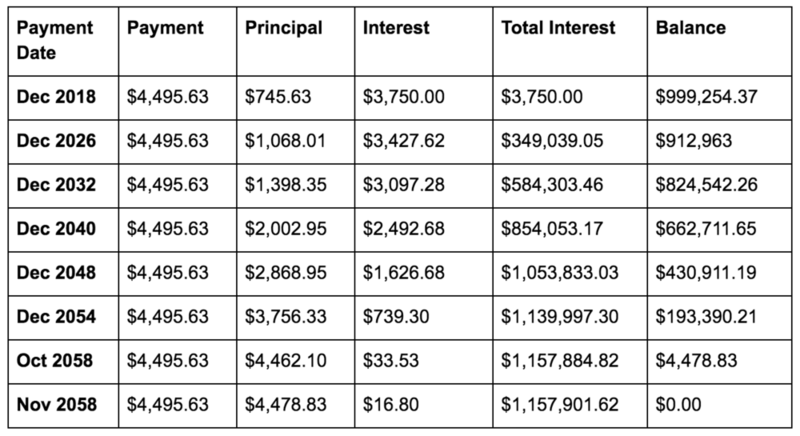 Below is a sample payment schedule with selected dates, including how much you would pay towards the principal and interest until the loan is paid off. If you borrow $1 million for 40 years (480 months) at 4.5%, you pay off the loan according to this abbreviated amortization schedule. Notice how much of the early payments go towards interest. Older PostWhat is the Department of Housing and Urban Development (HUD)?